The bombing of Dresden was just as horrific as the bombings of Hiroshima and Nagasaki. Dresden was an unarmed city, and was one of the major centers of culture in Germany. The bombing of Dresden was an act of genocide against the German people and given this occurred very late in the war; in March of 1945, the attack was done to further break the German morale. The attack was carried out with incendiary bombs [fire bombs], and to such an extent that nearly all of the oxygen was sucked out of the city and Dresden was reduced to ashes. The suffering of innocents was beyond the imagination. This bombing, like the bombings of Hiroshima and Nagasaki were direct attacks on unarmed civilians. The dates chosen for this specific onslaught on the German people coincided with the Christian holy day of "Ash Wednesday." Few people are aware of the fact that the 'Holy Bible' is nothing more than a book of Jewish witchcraft. For more about this see www.exposingchristianity.com. The Jews used this specific date [directing the spiritual energy of Christians] to reduce Dresden to ASHES. "Like most historic Jewish military operations, the great massacres of World War II occurred, not on the battlefield, but in peaceful neighborhood communities. This was in accordance with the dictate of the Book of Esther, which directs the Jews to massacre women and children, and to exterminate the families of those who dare to oppose them. Thus it was in Dresden, a historic German cultural center, where many thousands of German women and children, refugees from Communism had gathered. They were assured by the Red Cross that they would be safe, even while the Jewish generals were preparing to murder the men. 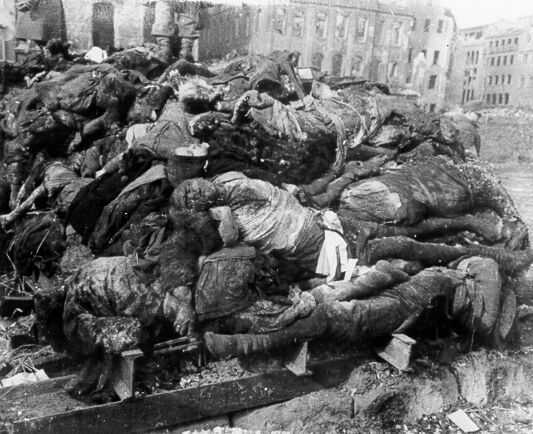 The blood-maddened Jews desired not only to murder as many German civilians as possible but also to erase from history all evidence of Western civilization, the greatest examples of White culture which had been gathered in Dresden, the irreplaceable porcelain, the priceless paintings, the baroque furniture, and the rococo mansions with their poetry carved in stone. All was laid waste in a mass bombing attack in which some 300,000 German civilians died in a city which was not even a military target! Like Dresden, Hiroshima was also an ancient cultural center, with no visible military objective. Its non- combatant families also died horribly by the hundreds of thousands. Many were pulverized instantly by the first atomic bomb ever used in a military operation, but thousands of other victims lived on for years, mangled and burned, their limbs and organs slowly rotting away from radiation poisoning. Even while the Japanese officials were desperately suing for peace, the Jews hastily ordered the dropping of a second atomic bomb, this one on Nagasaki, bringing off a second 'test' of their Hell bomb against helpless non-combatants, as prescribed by the Book of Esther. Again, hundreds of thousands of civilians died horribly." "Before World War II, Dresden was called 'the Florence of the Elbe' and was regarded as one the world's most beautiful cities for its architecture and museums. Dresden's contribution to the war effort was minimal compared with other German cities. In February 1945, refugees fleeing the Russian advance in the east took refuge there." "On the night of February 13, hundreds of RAF bombers descended on Dresden in two waves, dropping their lethal cargo indiscriminately over the city. The city's air defenses were so weak that only six Lancaster bombers were shot down. By the morning, some 800 British bombers had dropped 1,478 tons of high-explosive bombs and 1,182 tons of incendiaries on Dresden, creating a great firestorm that destroyed most of the city and killed numerous civilians. 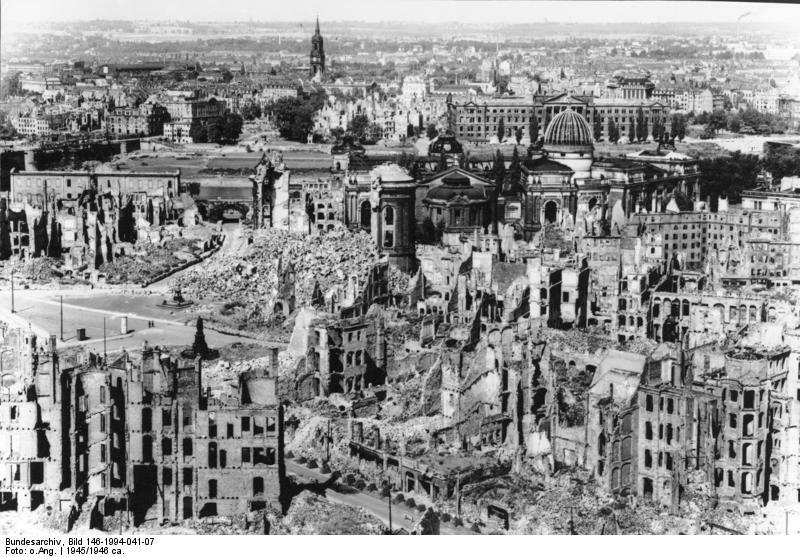 Later that day, as survivors made their way out of the smoldering city, over 300 U.S. bombers began bombing Dresden's railways, bridges, and transportation facilities, killing thousands more. On February 15, another 200 U.S. bombers continued their assault on the city's infrastructure. All told, the bombers of the U.S. Eighth Air Force dropped 954 tons of high-explosive bombs and 294 tons of incendiaries on Dresden. Later, the Eighth Air Force would drop 2,800 more tons of bombs on Dresden in three other attacks before the war's end." 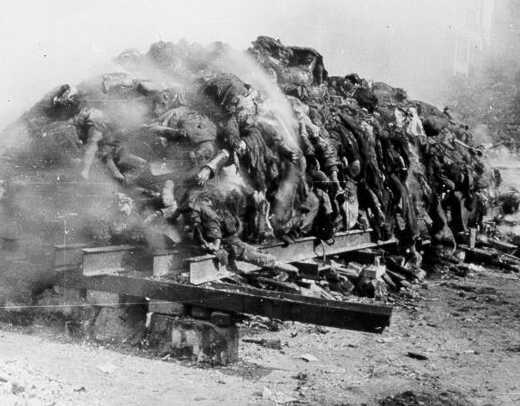 The movie "Dresden"  is a very realistic portrayal of the horrendous tradgedy. This movie is very graphic and extremely sad. Kurt Vonnegut Jr's "Slaughterhouse-Five"  also features the firebombing of Dresden.